The LOST ARGs: This debunked ARG is still going ! Despite what Jenny Balloon has said, there are still clues being posted on the various accounts that have been used so far. As this is certainly more diverting than staring at a blank TV screen waiting for Lost to come back I'll keep posting updates when possible. A new update on the SimeonHobbes.webs.com website has appeared. It has a Hebrew title and a new web site link to a shared text file. This file is again password protected. "Following formula is hidden in white letters like 4 statues, only one of which is often useful to be aware of color over the dark"
"Stay true to your enlightened Path along the Thread. Remember the true face of Henry Gale." Update Gary has let us know that is is a Hexadecimal code and translates to -"Trust in Jacob and ye shall be rewarded. Stay true to your Path." "Blessed is @Shethecatsma, for she is a true follower of Jacob." Possibly decoding the coded message and then sending a message to TheEntrusted will elicit this result ? I think Dark is as bemused as any one else on whether this is fake or not, however Dark is choosing to ignore it for the moment. I think all the smart money is on fake at the moment. New code is HEX for "Trust in Jacob and ye shall be rewarded. Stay true to your Path." 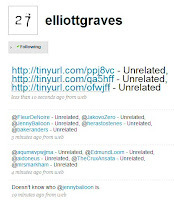 Elliott Graves has updated again to say several "characters" and videos are not important or relevant. It could be that we have two sets of fakers here, one faction wants to end the charade and one wants to continue. Of course there is the merest possibility that the Elliott Graves character is not a fake one ?